We continue to build on the success of the Pudding Club and the next event will be held on Saturday 23rd January at 7.00 p.m. in the Forman Hall. The theme of the next meeting will be Winter Warmers and as usual we shall be serving a starter (soup) followed by four puddings. The cost is £4.50 per head for CDT members and £5 for non-members, although you can join the CDT at the door. The event is a bring your own bottle. If you wish to attend please contact Judith Hutchinson on 880653 or judith@bitstone.co.uk before the 15th January to book your place. You will be made very welcome. Work under the Digital Scotland programme means that the first premises in this area are currently expected to receive fibre broadband in the period January to June 2017. We have a date. It's a very ROUGH date, but it's a date. The intention of this article is to update valley residents as to the latest on “Valley Broadband Speeds”. For those with little time, a short summary would be that there are 2 routes for the Borthwick Water Valley to faster internet. One is British Telecom bringing superfast broadband into the Valley, the other is through a Community-based Broadband Solution. 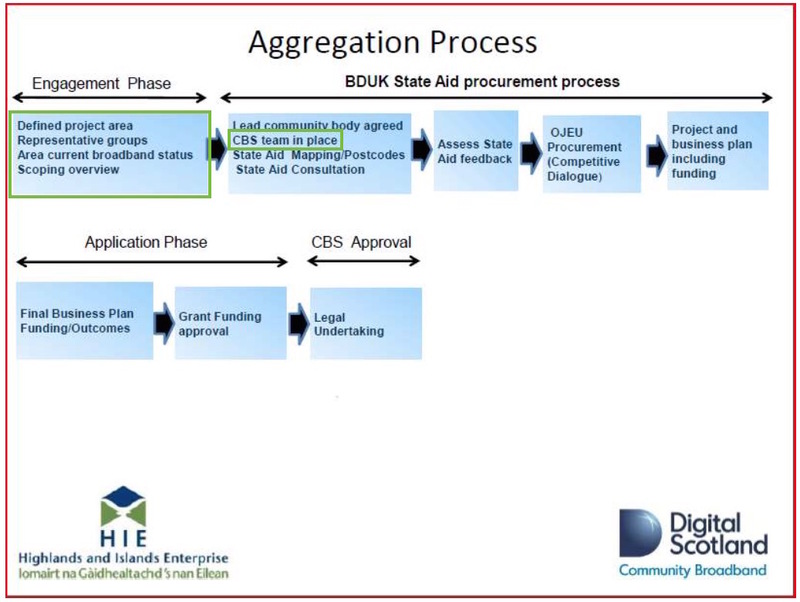 Neither is imminent, with the BT solution potentially coming sooner, and the Community-based Broadband solution taking years to achieve, although there is a chance we could piggy-back on a South Lanarkshire community-based solution that is much further down the line. Scottish Water have issued advice to their customers concerning bogus callers. Information concerning visits from Scottish Water employees is contained in the attached document. A yellow “be aware” warning for wind has been issued by the MET Office, effective from 6pm on Thursday 12/11 until 2pm on Friday 13/11. Gusts of 60-70 mph are likely with the possibility of gusts to 80-90 mph in exposed locations across the north and west of the area. There may be a risk of disruption to transport so take care if you are travelling. In addition, large waves may cause local over-topping along some coasts. The above rally, which is predominately for historic rally cars, will be driving through the valley on Sunday 29th November for a special stage at Craik. The stage is expected to arrive at Craik at 1.00 p.m. and leave around 2.40 p.m. It is estimated that 100 competitors will be taking part and the valley roads will be subject to increased traffic during the day. The Scottish Borders area is forecast to receive heavy rain showers and strong winds this weekend, our Neighbour Services Teams are proactively checking all the main grilles and watercourses throughout the area to ensure there has been no serious build up of leaves that could potentially block the grilles and cause issues. Fibre broadband is not currently available in this area. 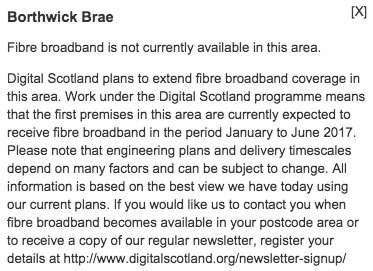 Digital Scotland plans to extend fibre broadband coverage in this area. Please note that engineering plans and delivery timescales depend on many factors and can be subject to change. All information is based on the best view we have today using our current plans. Our defibrillator arrived on Thursday 12 November. Pictured are the eleven of us who had excellent training from Sam at the NHS ambulance service. 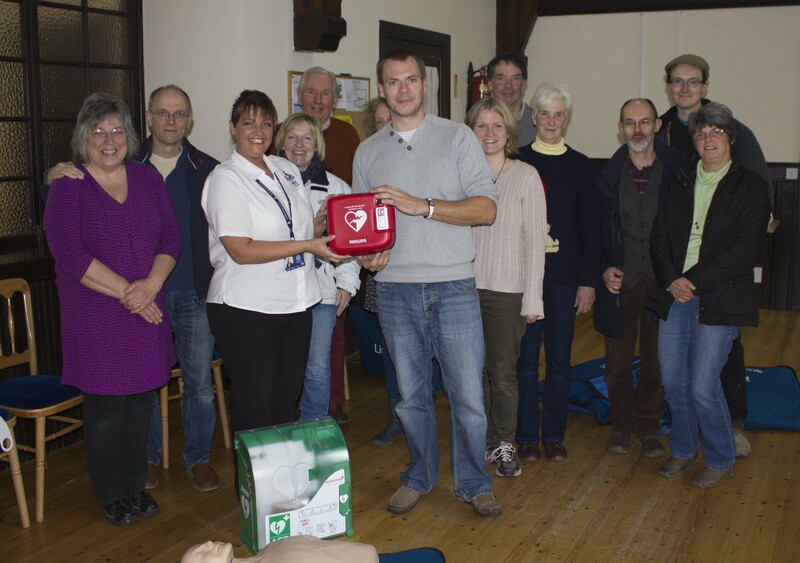 We are indebted to the ambulance service for providing a defibrillator to be housed at the Hall. It will be accessible 24/7. Samantha is willing to provide an evening training session for those who wish. If you are interested then please get in touch – 880256. 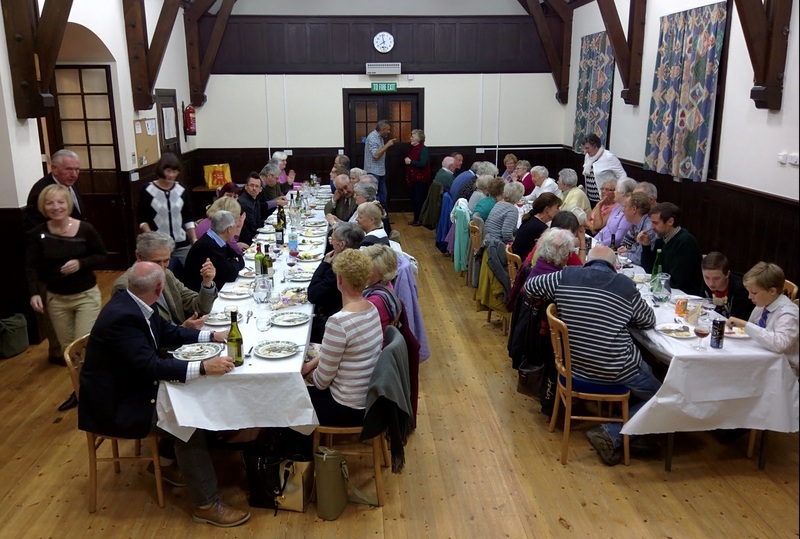 Well, last night was a great success with over 50 people attending this year's Harvest Supper at the Forman Hall, following the service at the Kirk. The Hall had been decked out with a great display by the Gardener's Forum Organising Committee and the menu for the evening was Sausage Casserole, Mashed Potatoes, Carrots and Broccoli, followed by Eve's Pudding. The usual Gardener's Forum competition ran throughout the evening with guests voting (with buttons) for their favourite entry. 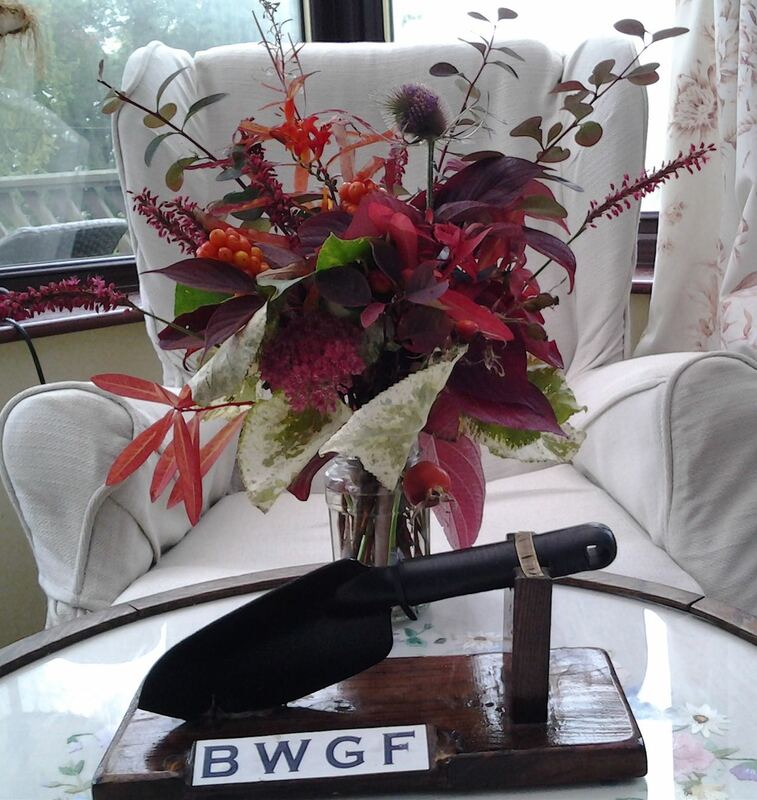 The theme, this year, was "Colours from my Garden in a 1lb jam jar" and the winner (by 1 button) was Alan Bone's entry (photo attached, featuring the trophy).